Many people, when they see me using a calculator in my job, argue about why using now a calculator, when there are so much more powerful alternatives. They always try to convince me about how much better is a spreadsheet, etc. Let me try to organize my thoughts about what's the point of having a calculator nowadays, when we have computers and, let's not forget, smartphones. If you are reading this, chances are you are as nut about calculators as myself, and you are as well faced with those questions from time to time. I hope then I can give you some elements for discussion. I would like to ask you to post your own reflections, to reinforce my arguments as well. On one side, it is true that an spreadsheet carries you further and with less effort - and it leaves a trace of what you are doing. You don’t need to write with your pencil the intermediate results. Today spreadsheets have very powerful instruction sets. And it is very likely that what I now think that can't be done with spreadsheets, is more due to my lack of knowledge of the tool than actual lack of that feature. I am now thinking of all matrices-related things. 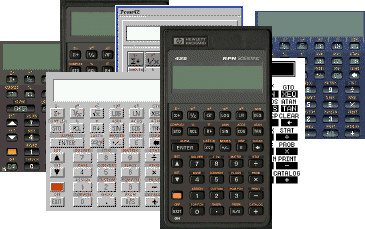 There were ROMs that enhanced its capabilities in areas that are the realm of calculators: matrices, etc. I am running in my Mac a couple of different HP15c, a HP42s, a HP41cx, and under the Windows screen in parallels, a HP50g. Even the most advanced scientific calculator (the wp34s), started its life based on the SDK of the 20b - if I am not mistaken. I have written a blog article for the humble Mac OSX calculator, that can be configured as RPN as well. The choice would be even bigger, were I running Windows as main machine. I have not explored the options for Linux. I might be interested if I still was in the Windows camp, but I moved to Mac and I’m not thinking about changing again. In most of them, the numeric keyboard works as well, as most of the basic operations. The keyboard shift works as F.
In some of them, there are side windows that can show the status of the internal registers, from seeing the whole stack and last x registers (good), to seeing all the CPU registers and flags (geeky). You can take all your calculators with you, instead of being limited to 2 or three. (I seldom travel with 2 calculators – most likely I take 3 with me: the hp 15c in my jacket pocket, the HP17bII for calculating at work, and either the hp 50g or wp 34s for fun at the hotel. You need to switch on your computer, and then you need to look for the application and switch it on as well. This takes 1 minute – unless you’re working with Mac – then you’re going after 16 seconds. Let’s see what Windows 8 brings to the table. In many cases, the calculator does not keep the state you left previously: stack and memories. This is not really a problem of the idea but of the implementation. There is no comparison between keying in in a physical keyboard and doing it with a mouse. It occupies real estate on your screen, the same as a calculator occupies real estate on your desk – however, screen estate feels always smaller and cramped than your own desk. (by the way, this is the reason that my HP19bII never takes a lot of use – same as with the HP71b. If you are using it in conjunction with Excel or other program, the switch from one to the other is never instantaneous – you need to click twice on the window – once to select it, another to start doing what you wanted. This happens between any two windows applications, by the way. There are times when you can’t use a computer – meetings! There are two kind of meetings in my company: with and without computers. When you see a meeting where everyone is using a computer, you can assert than more than 50% of the attendees are not really there, but emailing or finishing their presentations for their turn. Therefore, they are not listening to what whoever is speaking has to say. More and more, some managers are insisting that laptops are closed while the meeting takes place – at least, while they are speaking! Therefore, the calculator is your only alternative to number crunching during a meeting. As well, in a meeting you need to give a fast answer, and this would be difficult with a computer. With a calculator you can do fast and dirty calculations; with a computer, you lose and inordinate amount of time formatting even the most minute calculation. There is a brain switch that allows you to take approximations and shortcuts with a calculator, but impedes all but a perfect mathematical model when you try to do the same thing with Excel! As conclusion of part one: it is not clear at all that a computer can take all the work a calculator does. Let’s see in part two what happens with the other devices mentioned at the beginning of the article.